My Fairy Garden has been refreshed for 2016 (watch out for the advert hitting TV screens this week) and it gives your children a chance to create a magical oasis. 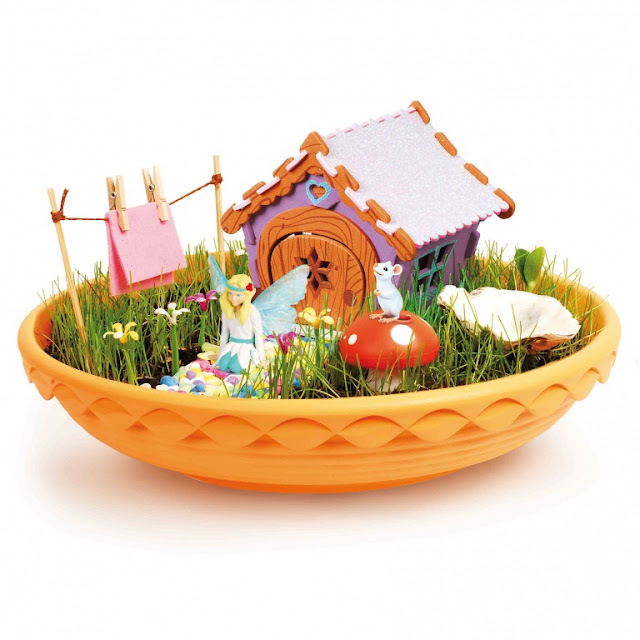 Included in this wonderful craft box is a 12 page activity guide which helps you learn just how to construct your gorgeously enchanting miniature cottage and pretty garden. The kit includes everything you might need to make your fairy feel right at home. Painted pebbles, collected shells and whatever else Livvy wanted to add. A nicely scented plant with pink flowers. some little coloured stones and shells, the rest would be down to my 2 girls, I would let them do most of it. Things collected from our walks at the seashore and along the river. I would give my granddaughter cuttings from succulents to plant. I'd put in glitter stones! I think my daughter would want to put some toy cars and Play Doh in it. I would put some pretty glittery shells and stones, some fairies and toadstools. Used to make things like this at school , great fun to do . we have a lovely collection of shells from the beach, I think i'd incorporate those somehow. My mini plastic flowers set. Tiny flowers, dolls house chairs and lots of glitter! The children gather all sorts of odd things such as tiny shells, toys and charms so I would put some of them in the garden. Flowers, shells and painted stones! I would put some tiny seashells collected from the local beach and use these as an edging around the bowl. Some pretty stones that my daughter has collected. A little barbecue - a fairy has to eat you know! Toadstools and little woodland animals. I would put daisies, daffodils, chairs, a table and a tea set in my garden.